This was the night for Comet PANSTARRS! 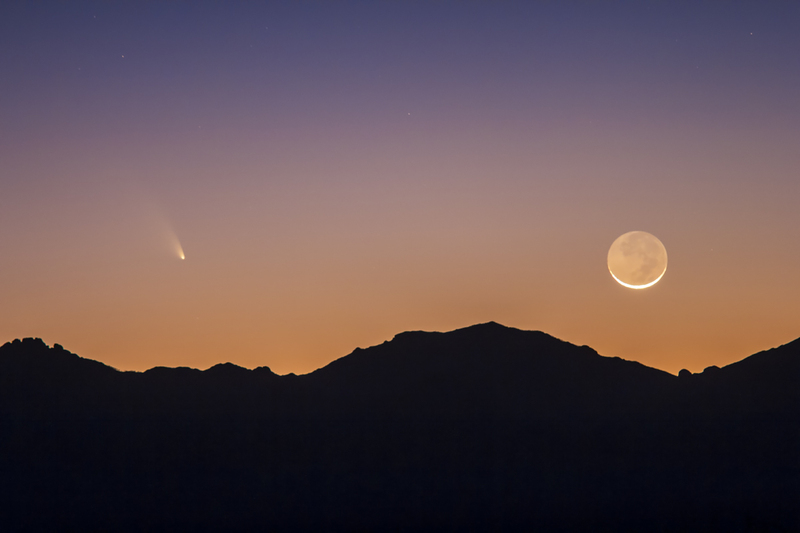 How often do we get to see a view like this, with a comet sitting beside a thin crescent Moon. Spectacular! Again tonight, about a dozen visiting and resident Canadians gathered for a roadside star party north of Rodeo, New Mexico, to view the comet and Moon setting together over the Chiricahua Mountains. 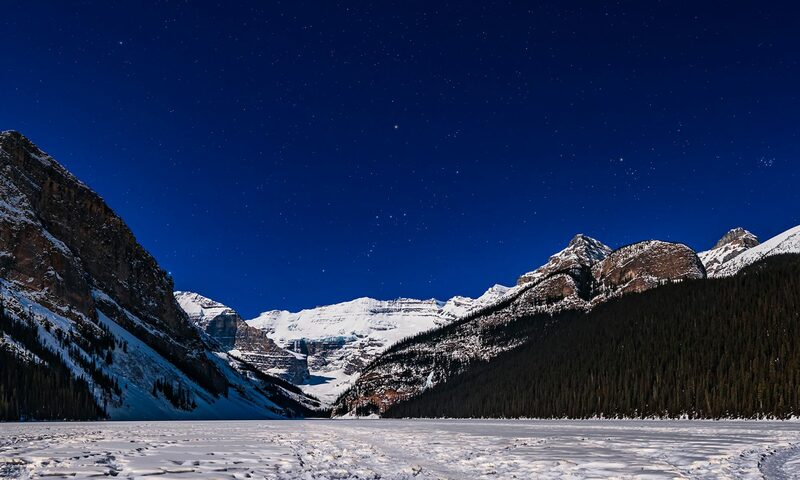 It was a stunning sight and made for a picture postcard image. The two set almost simultaneously, with the tail of the comet and “dark side of the Moon” lit by Earthshine the last to disappear behind notches in the mountain ridge. And tonight, with the comet higher, it was visible to the naked eye for the first time, but only just – the sighting was made easier because you knew exactly where to look. The Moon was just 3o+ hours old, so appeared as a very thin crescent. The entire disk of the Moon was visible, the rest lit by Earthshine, sunlight reflected off the Earth. In the clear New Mexico air, the Earthshine was easy to see even in the bright twilight. But adding in the comet made for a once-a-lifetime view. As soon as they set together, we all cheered and applauded, almost like at an eclipse. It was a memorable night, the kind you always hope for from a comet. PANSTARRS performed tonight! 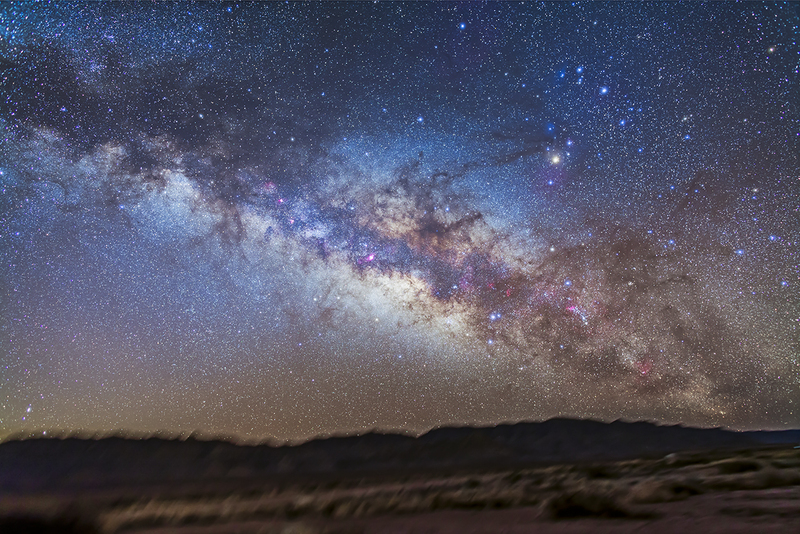 This is the view from early this morning as the centre of the Milky Way rises above the desert landscape of New Mexico. Sagittarius (at centre) and Scorpius (at right) contain the rich starfields of the galactic core. To the eye this scene looks as if bright clouds are moving in to hide the stars, but in fact the glows are stars – clouds of stars forming the glowing bulge of the galactic core. Superimposed on the glowing core are lanes of dark interstellar dust, such as the silhouette of the Dark Horse prancing at centre, with lanes of dust flowing across the sky and converging onto yellow Antares, the heart of Scorpius right of centre. I shot this before dawn this morning, March 12, from our site in southwest New Mexico. Skies were perfect. This is a stack of five 5-minute exposures with the 24mm lens at f/2.8. A sixth exposure taken through a diffusion filter added the star glows to accentuate the bright stars and their colours. The foreground is from one exposure and has been processed to bring out the details, here lit only by starlight. 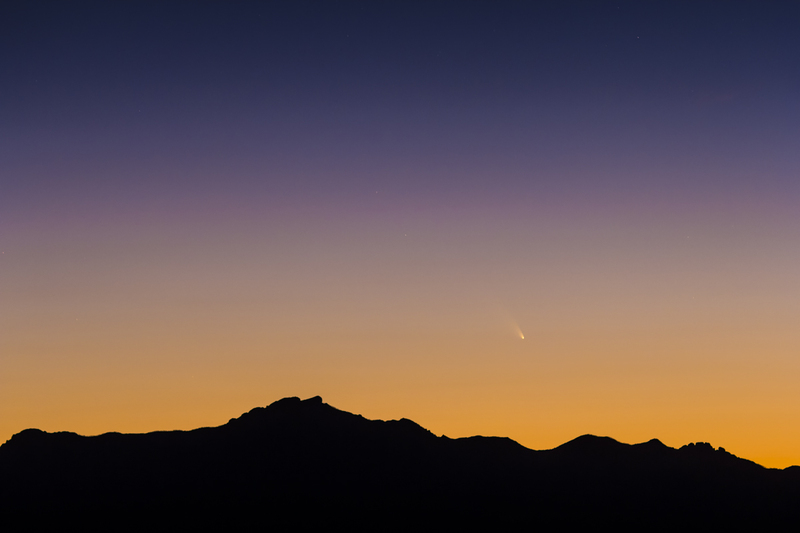 This was Comet PANSTARRS as it appeared Monday night, March 11, as it set over the Chiricahua Mountains. Tonight we drove north, away from our New Mexico resort, to find a site overlooking lower hills to the west, in order the track the comet for longer as it set toward the horizon. Friends from Winnipeg joined us, and as the Sun set, three more cars pulled up with astronomers from the area all looking for the best vantage point for comet watching. We had an impromptu roadside comet party. Even so, it was tough picking PANSTARRS out of the twilight and it was never naked eye. Pity this comet hasn’t blossomed, as a bright long tail would have been a beautiful sight in the sunset glow. However, it is what we had expected – a first time visitor from the Oort Cloud promising great things initially but never quite delivering on the promise. Still, we were all happy to see it and shoot it. This frame is one of 140 I took in time-lapse of the comet setting over the hills. We have ideal conditions for comet viewing each night this week, unlike many in the northern hemisphere now. So our little group of Canadians in New Mexico are taking some satisfaction in knowing we’re seeing it, and many aren’t. On the Apple iBooks Store and as PDFs for all devices. Click to learn more.